At least three people have withdrawn their names from consideration to run Sen. Amy Klobuchar's (D. Minn.) nascent 2020 presidential campaign in part because of the senator's history of mistreating her staff, according to a new report. 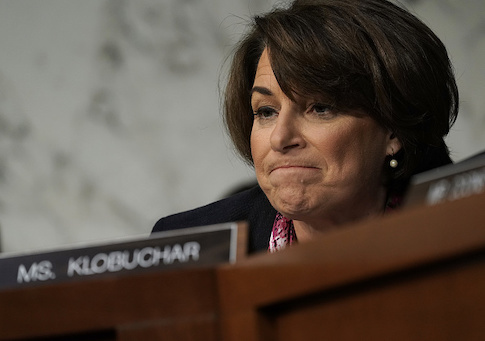 Speaking on condition of anonymity, former staffers in Klobuchar's office told HuffPost that the senator is "habitually demeaning and prone to bursts of cruelty that make it difficult to work in her office for long." According to the staffers, Klobuchar often sent emails to employees describing their work as "the worst" and copied large groups of staffers who were not working on the subject of the message, adding to the shame. A spokesperson for Klobuchar's campaign responded to the allegations. "Senator Klobuchar loves her staff—they are the reason she has gotten to where she is today," the spokesperson told HuffPost. "She has many staff who have been with her for years—including her chief of staff and her state director, who have worked for her for 5 and 7 years respectively—and many who have gone on to do amazing things, from working in the Obama administration (over 20 of them) to running for office to even serving as the agriculture commissioner for Minnesota. She is proud of them and the work they have done for Minnesota." According to some ex-staffers, however, Klobuchar's behavior in the workplace does not match her easygoing Midwestern persona, and she demands more than just the "high expectations" she sets for her office. Some staffers recalled the senator requiring them to run errands for her, wash her dishes at home, and pick up her dry cleaning. One staffer recalled an episode when most of Klobuchar's office was running late for work, so the senator wrote tardy slips and placed them on her employees' desks. At first, the late staffers thought it was a joke. But when one of the staffers came out of Klobuchar's office crying, it became clear she was serious. "She was constantly lighting new fires," a former staffer said. "When you have people who don’t want to work for you, you can't be as effective." From 2001 to 2016, Klobuchar had the highest turnover rate for staff in the Senate, according to the Legistorm index. Klobuchar had an annual turnover rate of 36 percent. According to more recent data, covering 2001 to 2017, her turnover rate was 35 percent, ranking her third worst in the Senate.